What if…no one knows the truth about you? This author’s previous book, The Leaving, was so compelling I immediately requested The Possible when I saw it on NetGalley. The cover is beautiful and the mention of telekinesis really caught my attention. Is Crystal’s claim of telekinesis a hoax? Does Kaylee have telekinetic powers? A few twists caused me to change my mind several times throughout the book. And I love the idea of a granny pod. Although Kaylee’s best friends are likable, level-headed teens, I didn’t care much for her character at all – which isn’t a deal breaker for me – but I wondered why her friends stuck around. She undergoes a change by the end of the book, but for the better part of the story, I found myself searching for some characteristic to warrant the loyalty of her friends. The gradual building of the climax kept me hooked, but the events really require a heavy suspension of disbelief. The Possible didn’t grab me like The Leaving, but I’d recommend this book to readers fascinated by unexplained events and the questionable effects and reliability of media coverage. This book is scheduled for publication June 6th, 2017. Sounds like a mixed review, Teri. Some strong points and some weak ones. The premise sounds really good. Exactly, Diana – highs and lows. Sounds intense! Thanks for the great review. You’re welcome, Stephanie – thanks for stopping by! 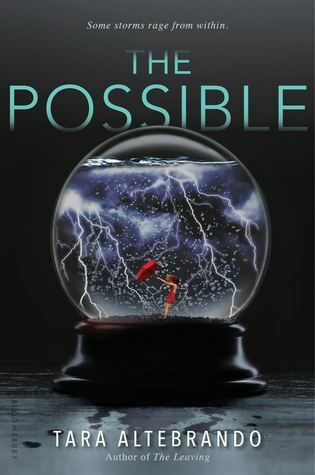 Check out the book, The Posible, by Tara Altebrando, from this book review on the Books and Such blog.